PPG Industries’ industrial coatings business has added DRAGONHIDE heavy-duty coatings to its lineup of polyurea-based protective coatings for trucks, commercial vehicles, heavy-duty equipment and other demanding applications. DragonHide heavy-duty coatings are designed to solve the toughest coatings challenges. 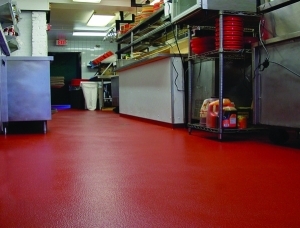 Developed as a value alternative to extreme-duty DURABULL coatings, which are based on a similar chemistry, DragonHide coatings are well-suited to protect beds, cabs, bumpers, step guards and body and underbody parts for pick-up trucks, tow trucks, dump trucks, buses, trailers and heavy-duty equipment used in agriculture, forestry and construction. DragonHide coatings, which are available in eight standard colors with color matching available, also are ideal for trailer interiors or applications such as stair treads and walkways in buses with available non-slip aggregate. Because of their elastomeric nature, coatings based on polyurea resins such as DragonHide and DuraBull coatings can withstand more impact, chipping, abrasion and gouging than other tough coating technologies. A proprietary resin blend and patented cross-linker developed by PPG enable the coatings to cure rapidly, which makes them much more tolerant to moisture during the curing process than typical urethane coatings. Consequently, they can be applied on the production line or in the field with a reduced risk of defects caused by moisture and humidity. DragonHide and DuraBull coatings are made without solvents, so they are nonflammable and free of volatile organic compounds (VOCs) and hazardous air pollutants (HAPs). They also offer an environmental advantage by eliminating the need to bake parts after coatings are applied, which reduces energy use during the coating process.